The Petal Passion Memories & More Card Pack is great value - I'll be using it to make cards for a LONG time to come! And they're so handy when you realise you've forgotten an event and need a card in a hurry! This is simply layers of Petal Passion Designer Series Paper, Whisper White cardstock and Petal Passion Memories & More card. 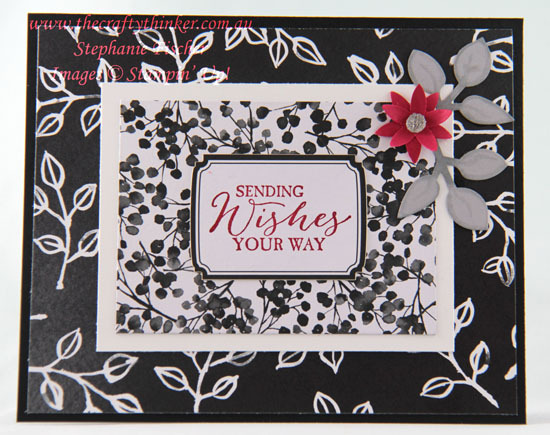 The greeting is from Butterfly Basics and is stamped with Real Red ink. The little flower is two layers of Real Red cardstock punched with the Blossom Builder punch, curled with a bone folder with a Faceted Gem centre. I used a Smoky Slate Stampin' Blend alcohol marker to add a little definition to the Smoky Slate foliage that was punched out with the Leaf punch.